Have you ever heard of Speed Dating? Our Hatchery participants took part in something cooler yesterday. The first Speed Mentoring Session in Accelerator London that we called Crowd Mentoring was a hit among Hatchery businesses & our start-up mentors. How did the evening go? First, individual participants pitched their challenges and business ideas and received tailor-made advice by the mentors. Then, they broke into 3 groups for mentor-led group session. They had 15 minutes to discuss an issue or challenge that they are facing before moving on. 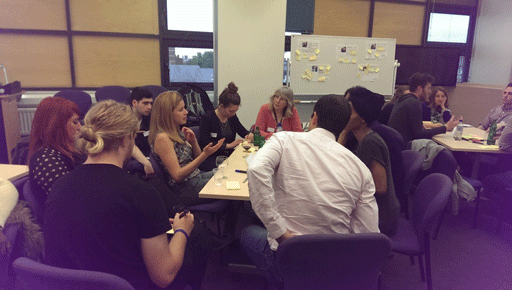 In total, each Hatchery participant got to speak to 4 different mentors and swap tables 3 times. The mentors helped solve pressing start-up challenges, gave one-on-one advice and offered lots of useful leads to our budding entrepreneurs. It was the perfect opportunity to learn about simplifying, shaping and scaling up start-up ideas, spotting and solving business challenges, finding co-founders, and, most importantly, connecting to and learning from those who have already been through the process of setting a start-up. Suzannah Lester has successfully led iPlatform, Facebook’s UK Developer, to acquisition, helped the growth of early stage CEOs in the investment company E-Synergy and co-organised the first start-up accelerator programme at The Bakery London. She has recently returned from a six month sabbatical in Barbados where she founded WP Google Apps Login for WordPress which has developed a popular Android application – Photos to PC. You could sense how passionate Suzannah is about the UK start-up scene and the London tech community – she literally owned the room & gave brilliant advice to the Hatchery participants. You can follow her @SoozeBadger. Michael Smith is the Co-founder and Director of technology service provider Appamondo, a technology service provider focused on transforming businesses through the use of cloud technology. Michael is actively involved with the StartUp community – he has spoken at StartUp Britain’s Tech Week, Superfast Broadband, and many other start-up events. His in-depth knowledge built during more than 20 years’ experience in blue-chip telecommunications, technology and retail was invaluable during the sessions. Follow him @mickeymondo. Emilio Sanz is the founder & COO of SalesGossip, a digital marketing service featuring news and promotions for over 900 fashion & beauty retailers. The company, which is on a mission to become the Spotify of fashion, was named one of the best websites for savvy shoppers by The Times, is the winner of RBS EnterprisingU Competition & SMARTA100 Awards. Follow his company @SalesGossip. Michael Raven is the co-founder and Managing Directors of Catch London, Digital PR, Marketing and Communications agency focused on Early Stage Technology Companies which operates on three diverse markets – London, San Francisco, and New York. Follow him @micrv. The participants are now taking their time to reflect – on the session, on the discussions, on the advice they were given and most importantly – on the actions they are to take as a follow-up. A big thank you to all our mentors and Hatchery participants! A new crowd mentoring session is coming up soon, we’ll keep you updated!